The ionosphere is the upper part of the atmosphere where radiation from the sun creates electrically charged particles. The effect of the ionosphere on radio waves is comparable to the refraction of light by a wavy water surface. Imagine looking up from the bottom of a swimming pool, to the lights on the ceiling. They move around, stretch and contract a bit. Likewise radio sources move around due to irregularities in the ionosphere. Radio images typically require very long exposure times of several hours. The average effect of the movements is a blurred image. Low frequency signals are affected more by the ionosphere. At the frequencies where LOFAR observes the ionosphere poses a severe challenge. Because LOFAR is a wide field instrument, the instrument sees a lot of different ionosphere. Gridding is the procedure of putting measurements onto a regular grid. This grid will then be transformed (by the Fourier transform) into the image. Each measurement is added to a number of points in the grid. The measurements are multiplied by a gridding kernel. These kernels are normally precomputed and stored in memory. The gridding kernel can include a correction for ionospheric and other effects. The problem with including ionospheric effects is that they vary over short time scales. That means that for each relatively short chunk of data, new kernels need to be computed. For LOFAR this is already a big problem, and it has been shown that for SKA, handling all these kernels is the bottleneck in imaging. To solve this problem we have used mathematical transformations to reorganise the gridding procedure, such that no precomputed kernels are necessary. Instead more work is done on the fly. The new procedure needs to compute more pixels and does so by relatively expensive sine-cosine evaluations. Rendering graphics often also includes sine-cosine evaluations, therefore some GPU vendors have added special units to their GPUs to evaluate them quickly. Although the total amount of computations for the new method is more than in the traditional approach, the structure of the problem is a far better match to the GPU hardware. The new method has been implemented within the DOME project. After further optimizations, the theoretically expected better performance was achieved in practice. 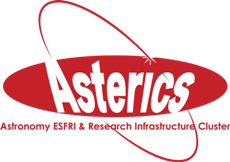 Within the ASTERICS project, we have worked to integrate the new method in existing imaging software (WSClean) that is used in the LOFAR pipeline, but also publicly available for radio astronomers worldwide. We have also analysed the method further and it turned out that also the numerical properties are better than the traditional method. A radio signal (simulation) without ionospheric correction on the left, and with ionospheric correction on the right. Image credit: Sebastiaan van der Tol (ASTRON).